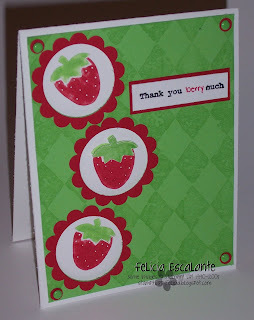 Stamp Happy Felicia: Thank You BERRY Much! A few other ladies and I are doing a mini card swap here in Germany and this is one of the cards I came up with. I got my Tart & Tangy set in the mail and just had to use it. I had fun making it and it was a lot of work sort of. You can't tell by the picture but the Green Galore piece has dimensionals on all four corners to make it pop up from the card base. I started off with a standard size card piece of Whisper White. I cut a piece of cardstock 5 1/4 X 4 and stamped the Print Pattern background in Green Galore onto the Green Galore cardstock. I then punched out 3 scallop circles and used my 1 3/8 inch circle punch to punch out the middle. I positioned the scallop cirles on top of the Green Galore cardstock and drew circles so I knew where to punch the wholes so I could stamp the strawberries directly onto the Whisper White card base. I used the Real Red & Green Galore marker to color the strawberry. The middle strawberry I embossed the top in Green Galore and put a dimensional underneath it to make it pop. My card needed some kind of embellishment and I didn't feel I had enough room for ribbon. So I opted to punch out 4- 1/4 inch cirlces and use Green Galore brads through them on all four corners of the card. I needed a sentiment and knew I wanted it to read Thank You Berry Much however the stamp from Much Appreicated reads "Thank you very much" I opted to use my Basic Black stampin write marker and ink up the Thank you portion stamp then hand wrote in the "Berry" in Real Red. I then masked off the first three words and inked up the much portion of the saying and stamped it. It looks so much better in person!